ProCard is a mobile enabled snow sports school management tool for instructors, supervisors and guests, fully integrated with RTP and other scheduling software. ProCard customizes its view based on a user’s primary role. Instructors can view their schedule, payroll history and effectively manage their client guests and their day. Supervisors view elements for managing instructors. Guests interact with their resort profile and view progress cards and marketing departments can monitor and track guest engagement. ProCard for instructors gives instructing staff the organizational tools they need to be successful with client guests. Whether teaching classes or private lessons, kids or adults, and no matter what discipline, ProCard empowers instructors and coaches to take control of their day. With ProCard Basic, up-to-date schedule information is instantly available to instructors as is payroll history. Other features available are shown in the pricing table below. Greyed-out items indicate features not available for that plan. ProCard for supervisors provides functionality for supervisors, managers, office managers and trainers. With Yard Report, on-snow supervisors can view instructor staffing lists for any meeting location, current inventory sales by product, any instructor’s schedule and a full up-to-the-minute private lesson detail report. No more radio calls to sales for lesson counts. No more paper lists. Smartphone enabled. Tablet perfected. ProCard can give guests their snow sports schools history and enable them to revisit their experience at any time. 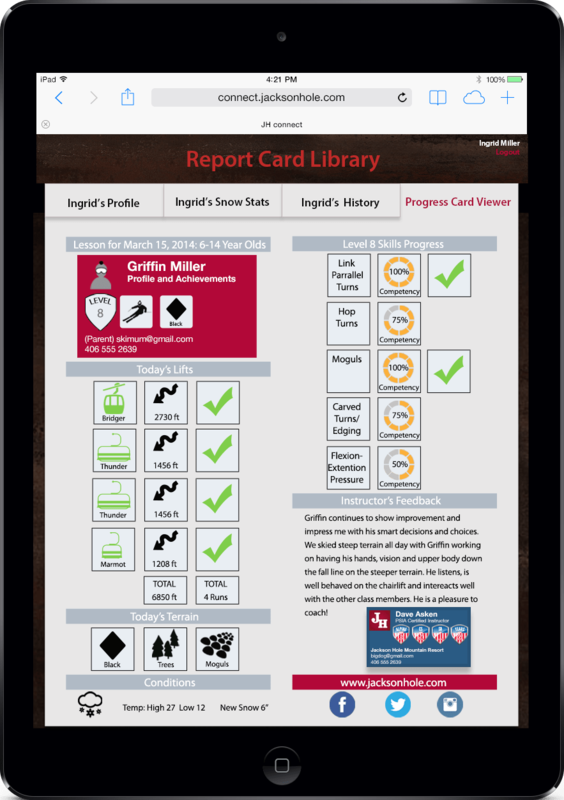 Guests can access instructor created progress/report cards detailing their achieved skill level milestones and view instructor feedback. Progress/report cards are available on our ProCard Custom plan or can be added to other plans upon request. ProCard can provide valuable metrics on how resorts’ top spending client guests interact with the resort. Insight can be gained from ProCard Analytics Dashboards on ways to further engage these guests and provide a higher level of guest service. Wow- ProCard’s new functions are making our team HAPPY! I’m overwhelmed with the positive feedback from our Pros, Coordinators and Managers. Level 3 certified Pro Instructor, Mt. Buller, Australia. Ben and Joes Private Ski & Snowboard School, Klosters, Switzerland.